Attention to the D5 Socialia Pro Users! Attention to the D5 Socialia Users! Please upgrade your D5 Socialia Version to 1.2.8 downloading from this place. We will also submit to the WordPress Repository soon for their approval. After Upgrading please change the necessary parts of slide-image.php file as before. 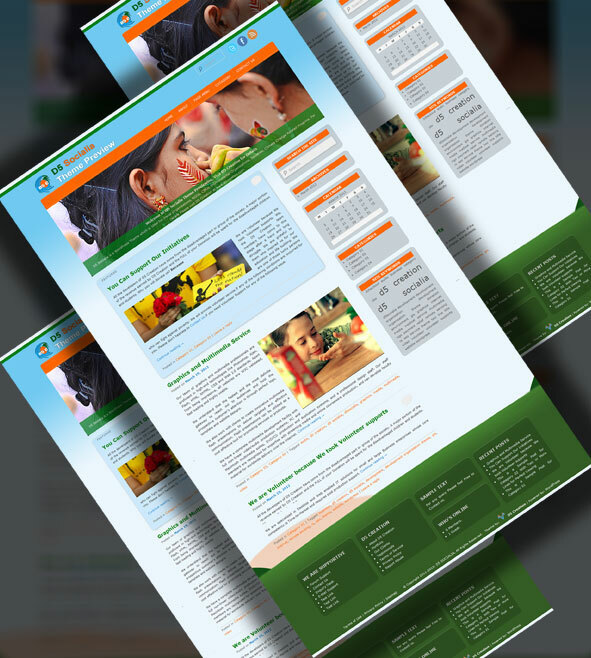 D5 Creation is proudly announcing the theme D5 SOCIALIA for Social Development Organizations. The D5 Socialia theme for WordPress is sophisticated, lightweight, and adaptable. This theme is better for Social Organizations basically for the organizations working for Climate Change, Disaster Management, Natural Resources Management, Environment, Environmental Management, Social Works, Social Deveopemnt, Cultural Organizations etc. It can also be used for Personal Blog. Make it yours with a Custom Menu D5 Socialia comes equipped with a Showcase page template that transforms your front page into a showcase to show off your best content, widget support galore (sidebar, Six footer areas, and a Showcase page widget area), and a custom "Ephemera" widget to display your Aside, Link, Quote, or Status posts. Included are styles for print and for the admin editor, support for featured images (as custom header images on posts and pages and as large images on featured "sticky" posts), and special styles for six different post formats. Do you need more options? You may like the D5 Socialia PRO Theme. Click the Image and Read Details. Win FREE STARTER Membership! Limited Time Offers! Something is wrong with the slide show. On the first run, the first image repeats twice with a black screen between the first and second time the image is shown. This only happens on the first run of the slide show. Thank you for your comment. This is happened because all the images are loaded for the first time but by that time the transaction effects start. We think that if your image size is lower and the number of images are not more this will not happen. Waiting for your further feedback. I am having the same problem and I can’t get it resolved. Also as my pictures are changing in the slide presentation the screen keeps jumping. Please help me resolve this issue…thanks! I am also having the same issue. Is this because the file is too large? I reduced my image sizes to smaller then the stock photos and still had the same problem. I then restored the .php file with the original PHP file, referencing the original stock photos and I still have the problem. I’m having the same problem plus if i’m waiting a while the slideshows starts to change every half of second. I think any of the expert users will answer this question. I am waiting for someone answer this question. This theme also has a Pro version. I don’t know there the problem exists or not. I am having the same issue … 1st images shows up, then disappears, then shows up again … waits six seconds, then goes to other photos. Once it goes through this process the first time … no more problems. But, when you are introducing someone to your website for the first time, and they see the glitches, it does not make a very good 1st impression. I have read the other posts, and obviously there is a glitch somewhere, because I’m not the only one having this problem. Please provide a fix. Love the theme, otherwise. Please use the latest 1.2.8 version. This version has been fixed the problem. I tried the 1.2.8 Version downloaded from here. For some reasons, I still have a black screen problem on the first run of the slide show. I don’t know if my setting/modification is correct or not. Any ideas to help fix the problem? We don’t know why you are facing the same problem in 1.2.8 version. You should complete replace all the theme files with 1.2.8 version. It works pretty well now after I re-installed it and did some customerized changes. The theme is beautiful and I like it very much. I installed the them from wordpress. Then I downloaded the 1.2.8 version and uploaded that to my directory. It is showing as 1.2.8 now but I am still having the slideshow problems of it showing a blank slide in the second slide and the next few slides seem to repeat to the original photo once or twice then the slideshow seems to work after it cycles through 1 time. Any suggestions. Latest version of Socialia theme has been fixed that problem. You should properly install the theme. If you are a STARTER, ADVANCED or DEVELOPER member of D5 Creation we can examine your site. Well I probably wont pay the $50 just to have you try to help fix a problem with your theme. But below is the info of my theme from wordpress admin area. I understand you wanting to have us pay for support but the free version should just work. 1.2.8 is working fine. You may check our demo site. Probably you kept some previous files. You should complete re-install. D5 Socialia links the sliding inages from a page so you should also replace that page. For D5 Socialia Pro the images are linked from the database. So you need to customize again after re-install D5 Socialia. But you need not do anything for D5 Socialia Pro after re-install. We respect your opinion. We want to provide support to all of you. But at the end of the day our staffs have to put food on their dining table. Comment is not a place for seeking support. For support issues please write in the Forum or Open a Support Ticket. Well I probably wont pay $50 for support for help on a free theme. My wordpress theme shows below in the admin area. Nice Theme, Thank you D5 Creation team for this wonderful theme. Your inspirations will help us to go ahead. Greetings to you. You can download it from WordPress Extend or from D5 Creation. It is very good. I think it is the best theme. Love this theme, but I am having some trouble getting the images to display as shown on the preview. I went to the slide-image.php to upload my own photos, but the images that are pre-loaded are not even showing. Is there something I need to do to activate it, or are there some better instructions for how I can modify to my own images/captions? First of all you need to upload your images anywhere you want or just replace the images from ‘wp-content\themes\d5socialia\images\slides’ directory with the same name of respective image. 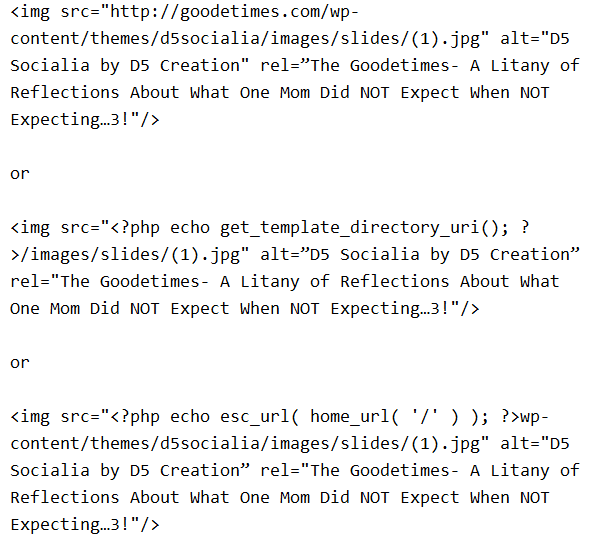 Open the slide-image.php file in your WordPress ‘Appearance>Edit’ window and replace the following codes. Replace the # by the url of the location that the visitor will be redirected after clicking on the image. Replace < ?php echo esc_url( home_url( '/' ) ); ?>wp-content/themes/d5socialia/images/slides/(1).jpg with the image location you uploaded or keep it as it is if you replace the (1).jpg with your image exact the same name. The text between h3 tags will be replaced with the image title. D5 Socialia is a WordPress Theme which is Ideal for Social Organizations, NGOs, CBOs, Environmental Organizations, Societies, Climate Change Related Progrms.You can Chnage these Images and Captions by Editing the < ?php echo site_url(); ?>/wp-content/themes/d5socialia/slide-image.php" will be replaced with the image or page description related to the image. Hope you will find the reply helpful for you. Thanks. I was able to alter the caption so that the wording is now appearing in the gallery, but I still cannot see the pictures. I did not alter the file names of the original pictures in the the Slide folder so I would think I would initially see the pictures that were built into the theme? I did redirect with my URL, but think that may be where I am making an error: Does this look correct to you? Yes, You only altered the Captions Heading, You can also alter the texts of the caption. Your code seems wrong. Please use any of the following codes instead of the given one. Nice Theme, I am using 3 of my websites. All the clients liked this theme. Thank you for developing the theme. D5 Socialia Theme Updated to 1.2.6 Version and Uploaded to Server on May 05, 2012. You can download the theme for free. Some changes have been made in this version. Unnecessary code has been deleted and the Theme has been more sophisticated and faster. The theme will now show the blog title and description if you have no logo image. Enjoy with D5 Socialia. If anyone is having trouble with images or links, check the themes folder name. …themes/D5-socialia/ I found some links are …themes/D5socialia/ (without the dash). This problem was fixed in 1.2.7 version. Please update your theme. Thank you for your comment. We will try to introduce some new options in the next update. By this time you are requested to update the theme to 1.2.7 version. You will find these options in D5 Socialia Pro. Please visit here for details. You can download from D5 Creation’s site. Hi, how do i remove the D5 Sociala logo and ‘Theme Preview’ from my site please? “D5 Socialia Theme Preview” is itself the logo. You can replace the logo with your own logo from the images folder of themes directory. And how do I change the text size? You can change the text size by editing the CSS values. Excellent theme! I am using this theme for the last one month for my site. I loved it. How can I get the PSD file of the logo? Thank You for your interest. Developer, Advanced and Starter Members can Enjoy the PSD Files and the Premium Contents. We will come with a Premium Version of this theme with Theme Options soon! You will need to resize each image in a graphics package, or ‘cut’ a section of the image to the size specified. I have yet to sort this is out myself, have tried using a different image size and specifying a different width but this does not seem to work, but i have only tested this with one of the default images and that could be why as I only changed 1 and not all of them. I use Paint Shop Pro, which is sufficient enough for image editing, there a number of open source programes available, try doing a web search for ‘edit image software freeware’ or open source. I am using this theme for a European Schools Comenius Project, I have posted a question on the forum re the logo; https://d5creation.com/forum/general-discussions-group1/general-questions-forum2/logo-thread6.0/#postid-10 whilst I have resolved this by creating an image file it doesn’t quite match the rest of the site and would prefer the title to be used. Hi, Have been searching for perfect theme, and think this is it. BUT, under my Dashboard I do not have options to customize color, header etc. My only option is to add widget.Under appearance I only have..Themes, widgets, menus, editor. What am I missing? Thanks! D5 Socialia Pro version offers Options for Logo Changing and Slide Image Management Options from Dashboard. D5 Creation is proudly announcing the PROFESSIONAL theme D5 SOCIALIA PRO for the Change Makers. This theme is only for the STARTER, ADVANCE and DEVELOPER Members. This version has come with Theme Options where you can customize most of the features of this theme including 12 slide image customization. Excellent theme. I love it. I implemented many of my clients site with D5 Socialia. The users who are facing image transitions problem are requested to minimize there image size. The 1.2.8 Version was uploaded to the server. This version fixed the sliding image black screen problem for the second image. Please upgrade your theme version downloading from this place. Nothing should be changed except theme updating. That’s it. how do I change the logo on version 1.2.7? You can change the logo file form images directory. If you want to change the logo from Theme Options You need to use D5 Socialia Pro version. Also I change the image on the slide but it shows a black screen then the double image, How do I fix that? You should download the latest version from D5 Creation Site and Use that version. The latest version has been fixed the problem. Is there a link for Socialia v1.2.8. I downloaded the from the button above and am still having issues with the slider. Any help would be appreciated. Version 1.2.8 was uploaded to our server. Please download now. Hi , i like the theme, is just the right style for our charity. I have problem with the excerpts. 1. I would like to change the “continue reading” (when using more tag). I altered a php file where this is coded, but I still get the same text. my menu is on the right, but I want it on the left. How can I change this? Or is this default? BTW, we visited your site. In GPL you can edit everything of a theme but the developer should have a demand that the users will keep the creditline for a theme. I’m going in circles on the web site trying to upload the latest version of Socialia 1.2.8 from the “server” Could someone direct me to how that is done and where I find it? Download the latest version from D5 Creation and Upload the Theme to your themes directory by WordPress Admin Appearance.